Written for Interactions magazine by Peter H. Jones. In last year’s January + February issue Usman Haque, Paul Pangaro, and I described several types of interaction—reacting, regulating, learning, balancing, managing, and conversing. In the July + August 2009 issue, Paul Pangaro and I described several types of conversing—agreeing, learning, coordinating, and collaborating—and we proposed using models based on Gordon Pask’s Conversation Theory as a guide for improving human-computer interaction. Peter Jones responded, noting that there are other models of conversation and prior work in bringing conversation to human-computer interaction in particular Winograd and Flores 1986 work with The Coordinator. We agree on the importance of The Coordinator and invited Peter to outline the history of models of conversation and their relationship to HCI. His response follows. This article will step back in time to retrieve alternative, influential views of conversation for design, and then bring the discussion forward to current situations where we might learn from this history. Three historically parallel pathways can be shown as influenced by a common circle of systems theorists: the well-known language/action perspective (LAP) , Rittel’s argumentation perspective , and the dialogic design school, emerging from Christakis’s structured dialogue  and Warfield’s science of generic design . Distinctions between these three perspectives are readily apparent in the embodiments of their design languages in software, with very different routines for conversation modeling. 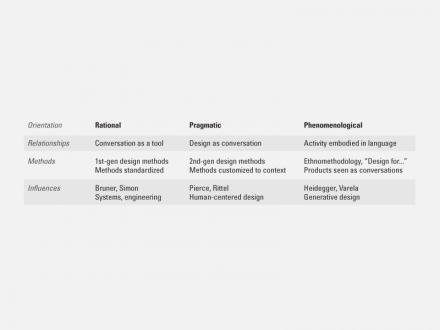 They also share a central concern with the role of generative conversation for design outcomes. The current article series attempts to coordinate common elements and concerns among perspectives in the attempt to establish a workable common ground. This article focuses on the theory of conversation embodied in LAP—an influential framework of phenomenology, pragmatics, and speech act theory. While LAP has received significant attention in prior ACM publications, the framework deserves further consideration in light of renewed interest in the systemic view of conversation in design. The emergence of massive social media networks has inspired interest in social design and social systems, particularly in applications to network systems, including business models, online social activism, and organizational systems. What are the contexts for conversation? Most theories of communication assume a dyad model of information exchange: two individuals talking with each other. Cherry defined “communication” as the exchange of normatively defined meanings and creating understanding between purposeful social participants . Conversation is seen as a form of communication in which a particular exchange takes place between at least two people at a time, representing individual interests or intentions, or collective interests represented by individuals. In everyday parlance, we subscribe to a more inclusive view. In fact, many and perhaps most conversations occur as or start with small talk. Known as phatic communication, it is present to some extent in most real conversations, and is identified as orientation” in the LAP model. While its power to reinforce relationships should not be minimized, here we focus on purposeful conversations that enable the coordination of multiple perspectives in the activity of designing. Any design activity is guided by the intention to change a situation in accordance with a communicated desire or intention. Conversations for design must reflect and preserve the positions and contributions of multiple participants included (and excluded) in the model of change. By “merely” speaking, the designer creates a context for the relative inclusion of stakeholders or users, an ethic explicitly revealed by his or her conversational model. By extension of this assumption, the way we converse may also be seen as, perhaps unwittingly, reflecting our working philosophy of designing. Several implicit models of conversation can be identified that guide participation in very different ways. Three epistemological orientations include the rational, pragmatic, and phenomenological. The rational perspective may be viewed as an instrumental and purposive individual communications system used by designers to achieve sophisticated design outcomes. 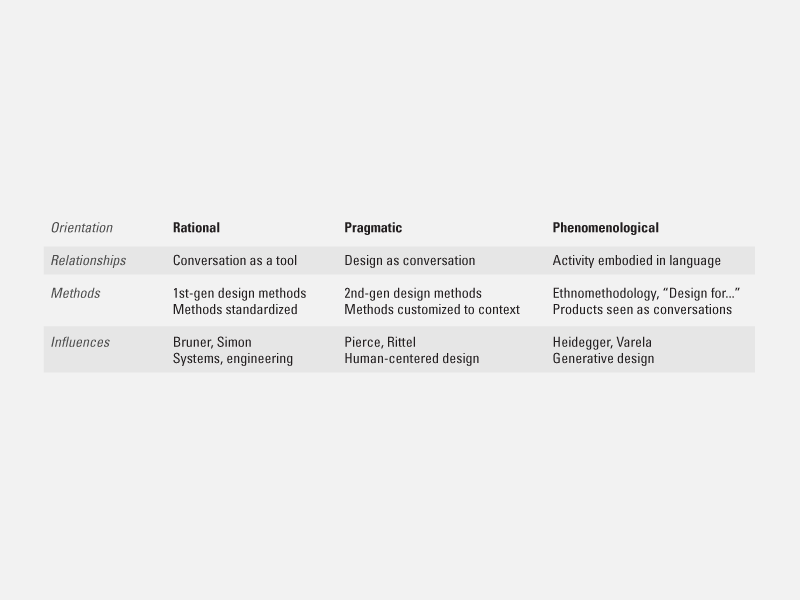 Conversation can be understood as a set of patterns employed as skillful means in facilitating the relationship between designers, stakeholders, and product or materials. This is the mainstream perspective in our technological culture, and perhaps the way most readers view conversation in design. This perspective is observable in practices that employ a well-defined set of methods and communications with every problem situation. A pragmatic perspective considers design an inherently communicative practice, where design activities enact the creation of a linguistic system of meanings applicable to a problem in context. In practice, we create a unique coupling of appropriate language to the design situation, following stakeholders and their lifeworlds rather than promoting our own language of design. When we customize design methods to suit a particular purpose, rather than pull methods “off the shelf,” we reveal a pragmatic philosophy. A phenomenological perspective acknowledges that all meaning arises in language, that human activity is not separate from language. 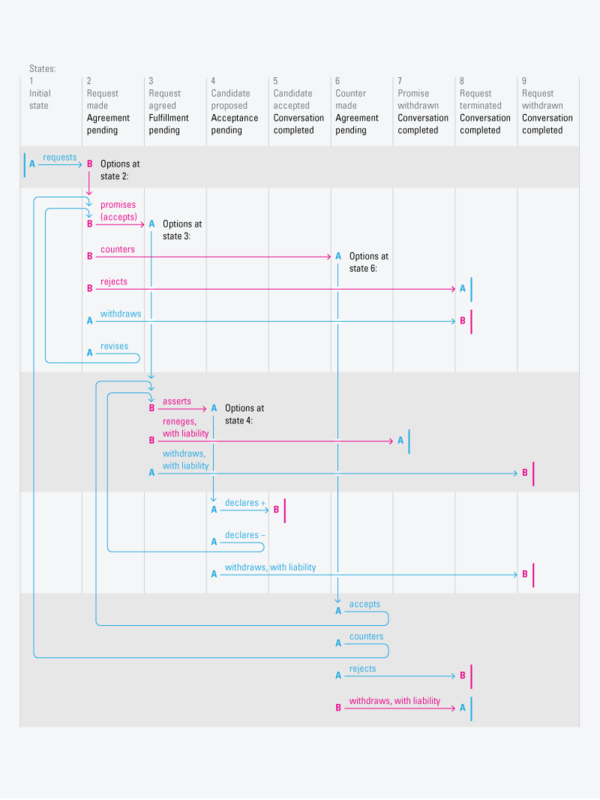 This view suggests that design itself is a conversation, products and services are networks of other conversations, and designing acts are performed and recognized by language. Conversation is not a tool for outcomes; rather, language uses us, shaping and constraining our work and experience. These are not mutually exclusive perspectives; designers may adopt different perspectives to calibrate responses to a situation, while scholars may be adherents of one school of thought. And while not an inclusive list, perspectives from sense making and constructivism, for example, range beyond this current focus of conversation for design. Elements of all three perspectives, and more, could inform responses to a single problem. The language/action artifacts appear to embrace elements from all three schools, even though the foundation text presents a phenomenological perspective. Readers of interactions and Communications of the ACM may be familiar with Winograd and Flores’s (1986) LAP work . Flores demonstrated successes in software (The Coordinator and Action Workflow), education (Logonet and Landmark), and management (Business Design) based on an integral philosophical system. While LAP’s critique of the artificial intelligence field had an enormous humanist impact, its longevity was disrupted by critiques of the embedded conversational model in The Coordinator. Today we may consider the irony of how the LAP, a critique of the micro-cognitive and rationalist view of AI, was itself critiqued as socially deterministic (macro-cognitive) and insensitive to natural human interaction. However, LAP reenvisioned cognition and agency as responsive to action in the world, a humanistic concern. Winograd and Flores’s unit of analysis for embodied cognition was conversation, expressed in an explicit phenomenological approach known as ontological design. Ontological design was construed as a practice of formulating conversations to invent new modes of being and co-create action. 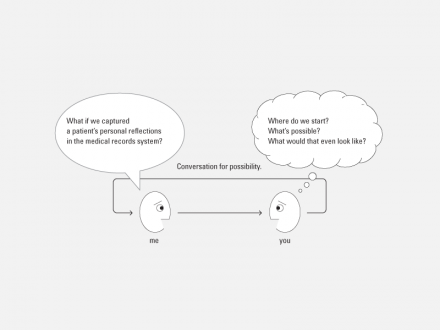 Conversation was deemed the appropriate way not only to explore the possibilities invented in design activity, but also to generate those possibilities in reality by intentional speech acts. Assertives commit a speaker to the truth of an expression. Directives (such as requests, commands, and advice) cause the listener to follow a requested action. Commissives (such as promises and oaths) commit the speaker to future actions. Declarations change the circumstances of reality to accord with a proposition (e.g., pronounce a couple as married). Expressives convey a speaker’s attitudes or emotions about a proposition (e.g., praise, gratitude). The applicability of performative speech acts in design was pointedly critiqued, essentially based on the hermeneutic problem that a listener might interpret an illocutionary point different from the speaker’s intention . However, Searle’s model provides a descriptive power of language as action helpful in understanding and even guiding the messy dynamics of design practices. And since conversation (and hermeneutics) is recursive, continuous, and correctable, the interpretive critique seems overwrought. While a conversation must be “about something,” conversations often have no purpose other than social mediation and acknowledgement of phatic communication. Conversations that lead to action exhibit intentionality, and differences in conversational structure are apparent. Orientation is maintained by conversation that mutually regards a shared referent object (e.g., the weather), “creating a shared background as a basis for future interpretation of conversations.” The intent of this so-called phatic communication is merely acknowledgement. Conversations for possibility include interpersonal queries, inquiries, and propositions that “open a context.” Winograd notes the importance of common ground(background), including prior intent, upon which speakers can instantiate new contexts for conversation. There are no “goals” in conversations for possibility, but rather the co-construction of understanding and novelty. A conversation can be observed as moving through progression of stages, where an opening affords the potential for action. The coordination of action requires meeting what Searle calls conditions of satisfaction . Conditions may include some agreed outcome, and agreements about necessary quality and future dates. While some may consider these conditions goals, LAP does not refer to goals in the objective sense . This difference is crucial, as LAP suggests that we honor the commitment, as if spoken between persons, not the objectives. 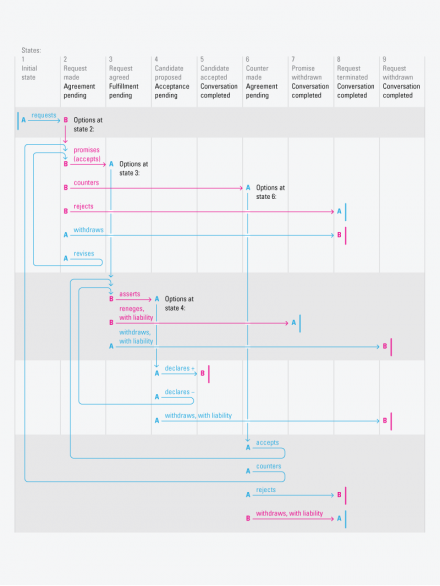 This model has much in common with the discovery orientation in design practice. Designers are taught to “challenge the brief” and to help clients reformulate a problem as given so that the right framing of a problem is adopted in a design project. 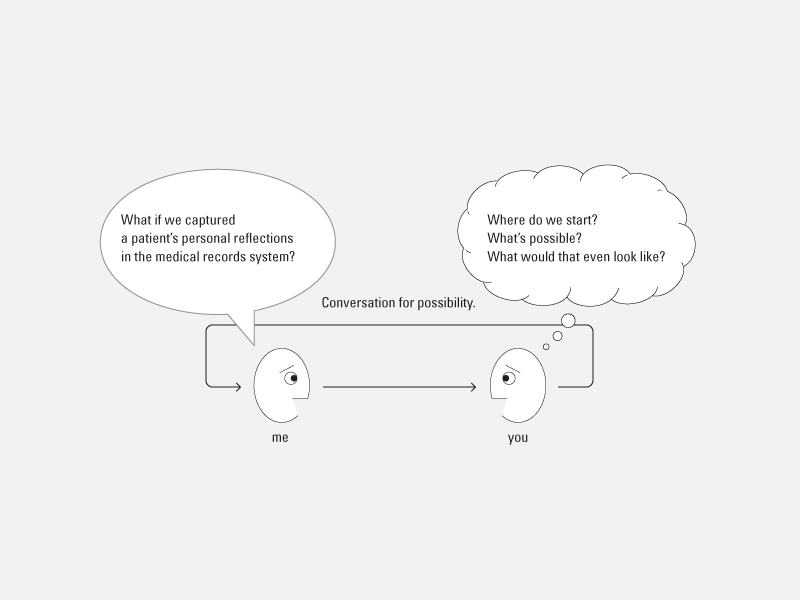 The skills for mediating conversations for possibility are learned through the experience of navigating different frames of possible visions or outcomes in conversation. 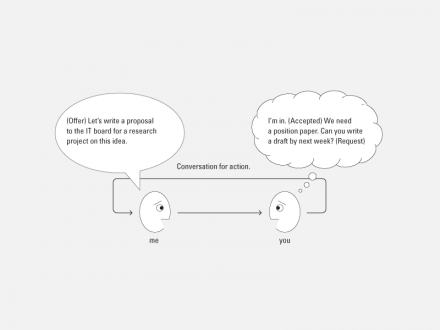 Other distinct “conversations for” that were not proposed in LAP show in a designing context, as they occur as patterns of sense-making between committed participants. Conversations for understanding (or dialogue) and for clarification (convergence) are two that might be further distinguished. Moving the “right possibility” toward a conversation for action is another embodied skill. The ability to move stakeholders in social design situations is not seen as a rhetorical, persuasive skill, but one that turns on what Searle identifies as illocutionary force. This is the extent to which action is performed by words, not by the semantic content, but by the speaker’s intent. The variable capacity to move together toward action is embodied by the speaker at the time of utterance. This distinction is inherent in LAP’s formulation of ontological design—design actions are co-created by speaker and listener at the time of conversation in a mutual grounding of understanding and agreement. Early email systems followed a slow adoption curve, given the limitations of computing and networks. Free-form email was initially perceived to be unnecessarily constrictive, a “cold” medium that was not at all conversational. During the years The Coordinator was available, early conventional email systems were used for sporadic and discretionary communications. The ubiquitous acceptance of email required a span of five years to alter communicative practices, even in dedicated organizations. While The Coordinator did not fit the cognitive style or tasks of existing organizations, even unstructured electronic communications were fraught with resistance and halting advances. Since The Coordinator also required a commitment to managing accountable communications, its use was limited to fairly small and dedicated networks. The design and flaws of The Coordinator might still teach us about structuring conversations and accountable communicative actions. Perhaps the system’s intent was, as Lucy Suchman said, “to remedy the carelessness of organization members regarding their commitments to each other through a technologically based system of intention-accounting” . Yet this critique focuses on the functions of The Coordinator, as originally designed. Speech act theory was certainly not perfectly matched to the intended domains of conversation. Searle’s explicitly-described theory does not preordain a “rationalist” implementation. As a conversation theory, it retains constructive power for formulating social (and therefore design) commitments as acts by their very communication. One can agree with the underpinning concern of Suchman’s critique while identifying significant exceptions. For one, regulated organizations could benefit from Searlean communication by filtering today’s overwhelming volumes of data by displaying information by action: requests, commitments, dates, and implicit promises to network participants. LAP-structured conversations might enhance communications in complex, high-reliability organizations. Winograd’s 1987 case study of hospital conversation flow foresaw the usability nightmare of electronic medical records systems. In regulated environments the coordination of commitments is as important as data quality. In operations such as healthcare, transportation, and the military, the ability to manage and respond to commitments fosters operational resiliency by managing actions that occur “as speech,” such as orders, responses, announcements, and outcomes. The entire chain of commitments following a medication order would be tracked as a directive conversation, rather than as “workflow.” It instantiates a process based on verbs, action, rather than nouns and objects. While Google’s adoption of the “conversation” as unit of communication appears to build on this perspective, in practice, few email threads are true conversations. The meaningful verbs that prompt action are hidden in today’s electronic communications. While The Coordinator software passed into collective memory without further enhancement, Winograd and Flores’s bold experiment in organizing communication should be evaluated from an innovation perspective. Consider the audacity of introducing a dedicated, tightly structured email system in the late 1980s. As an early adopter, I found its most significant difficulty was the macrocognitive problem of its lack of organizational fit (as suggested by Suchman’s critique) and the necessity of changing communicative practices. For it (or any email system) to be of value, all participants in an action network had to agree to use it consistently. A major contribution of LAP was creating a design language for the construction and monitoring of commitment. As Web-based systems have greatly enabled the ability to collaborate, people are easily overloaded by multiple communication channels. Managing commitment and attention remains the weak link in our technology panorama. 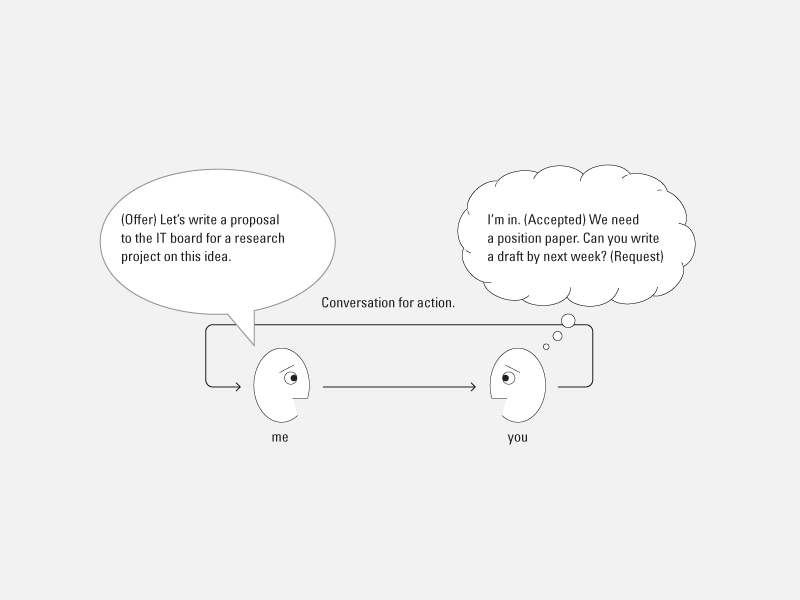 A conversation design perspective can enhance our coordination of attention as well as action. With respect to The Coordinator, I would make the personal observation that successful software systems are rarely treated as newsworthy in scholarly publications, and failures are typically ignored. Successful software products are discussed only peripherally. With no venue for cooperative constructive critique of social and interactive artifacts, we collectively risk losing the value of learning from the wisdom embodied in such artifacts and their adoption by real users. We also suffer the loss of shared meaning from collective memory by not sustaining an academic tradition of a balanced interpretive review and critique of artifacts we design and endorse. Perhaps interactions might host such a critique as a shared conversation toward creating a critical discourse, in support of creating a constructive shared memory. Finally, the emerging perspective of purposive design, of “designing for” (e.g. sustainability, thrivability, transformation, care) shares an ontological basis with “conversation for” in terms of intentionality and social teleology. When designing for a purpose, our “conversation for” that purpose brings it forth, a distinctly different view from a design method perspective. These and other proposals ought to be considered in the emerging reconfigurations of design thinking and practice. Peter Jones, Ph.D. founded the Redesign innovation research firm in 2001, and conducts independent and client-based research. Redesign, specializes in information and process strategies for scientific, organizational and healthcare practices. Jones is writing Design for Care (Rosenfeld Media. 2010), exploring how new design thinking is transforming healthcare. He resides in Toronto, where he is on faculty at Ontario College of Art and Design. Find Peter at Design Dialogues. your article is very good, we need more because I need to design a course of teaching conversation. I am a design engineer and I thought this article might be about the importance of conversation in the design process, however, I was not able to understand it. It seems instead to be part of a “conversation” intended only for acedemia and not for normal people. To Mr Dubberly, many thanks for providing some very interesting background details on what has been a longstanding design convention. To Mr Poehlman: I think you do the author an injustice. There are lots of things in science that are abstract formalisms, created in order that we can see common features of sets of things in the world. One of these things is conversation, which involves (in the abstract) the rotation of the role of speaker between participants, according to rules. Once you have the abstraction in place, you can analyse all situations belonging to that set. As a design engineer you would be familiar with such abstractions as “design”, “engineer” and “process” which you are using in a way that your so-called “normal people” wouldn’t understand. The Language Action approach seems to not make a connection with the broader cultural framework that needs to be established and agreed for communication to occur: even in Searle-ish terms. He still has the simple communication dyad in mind, it seems, and only partly sophisticates it. The communicative context is not so much defined by the immediate communicative intention or its objects, but within the framework of shared understandings, contextualising cue and inter-subjective messages that are the basis for culturally meaningful conversations. Think of the code words, and other ‘in-group’ clues that a pair of professionals use with each other that exclude outsiders (not always intentionally) but make the communication efficient as the shared ground is inferred to the satisfaction of both; only then the LA exchanges can have meaning. I going to do a paper doing analysis about ( conversational analysis from Winograd and Flores) and the theory for SAcks but in aphasic patients please write me i will agree to talk with you about it because your paper its very interesting. Interesting article, I am reading it as additional reading as part of my syllabus for human computer interaction. Hey there! Quick question that’s completely off topic. Do you know how to make your site mobile friendly? My site looks weird when viewing from my iphone 4. I’m trying to find a template or plugin that might be able to resolve this problem. If you have any recommendations, please share. Cheers!